For those of you that have been living under a rock the past few years, Hyundai has been on a tear. 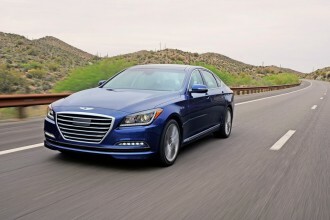 When many automakers were losing money and facing financial uncertainty, Hyundai was gaining market share and selling volumes. Their stable has increased from small economy cars to large luxury sedans all at an affordable price within their respective segments. To add a bit of flair to their lineup, Hyundai introduced the Veloster in 2011. Its quirky styling and unique 3-door body style set it apart from the automotive landscape. 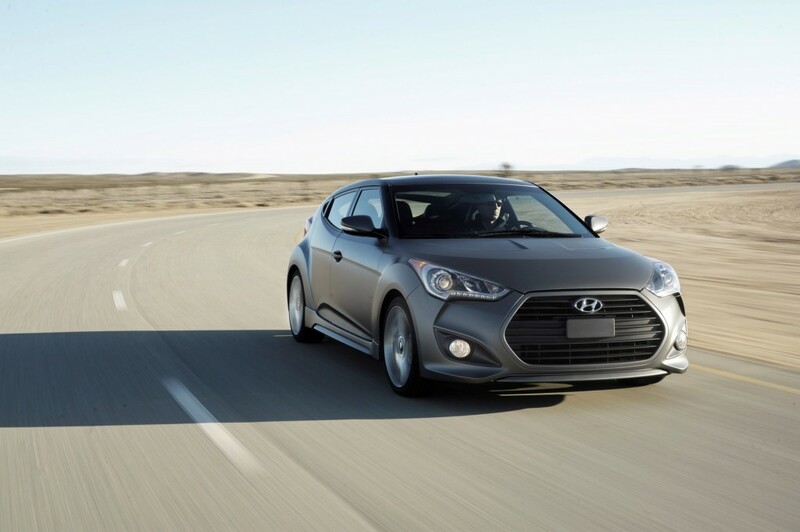 A year later, Hyundai introduces its high powered version of the Veloster, the Veloster Turbo. The Turbo adds some much needed punch with its 1.6L mill, which is both direct injected and fitted with a dual scroll turbo, good for 201 horsepower at 6000RPM and 195 ft-lbs of twist at an early 1750RPM. It pulls strongly early and lasts through the mid range making blasting from corner to corner quite fun. The exhaust note isn’t very noticeable, however you can clearly hear the turbocharger whistle to a peaky 18psi of boost and that was enough to put a smile on my face. Hyundai also integrated the exhaust manifold with the turbo saving it 4lbs. I was only able to get a hold of an automatic equipped Veloster Turbo. The dual clutch unit is only for the non-turbo models due to the fact that it cannot handle the rigorous demands from the turbo 4-pot. Instead, it is offered with a 6-speed automatic transmission with steering wheel mounted paddle shifters. Shift the shift knob into Drive and then move it over into S to get into Sport mode or just tug the plastic paddles on the steering wheel to save you some time. Shifts are fairly quick for a regular automatic are are similar in feel to the Elantra Coupe and GT. The automatic, when left in Drive, shifts smoothly and effortlessly, keeping the engine speeds low and in its ideal torque range. 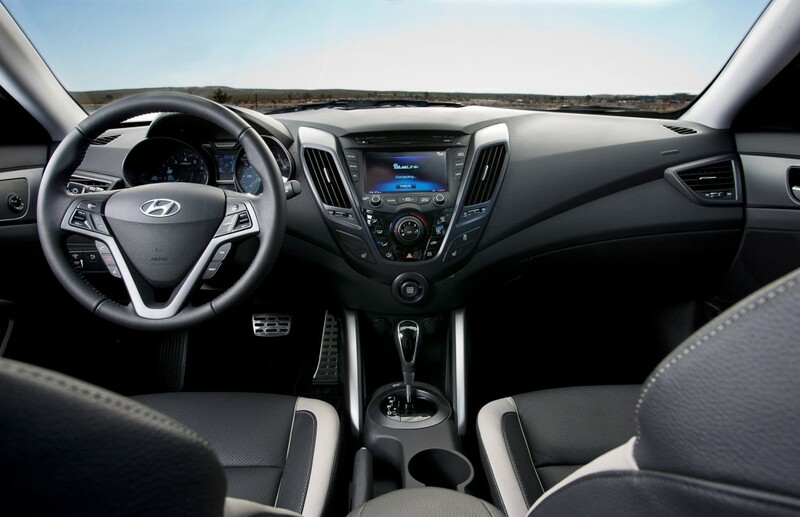 In sport mode, the shifts feel quicker in the Veloster Turbo than they did in the Elantra Coupe and GT. The only down side to steering wheel mounted paddles is that they are hard to get at when turning and its better off if you get it into the proper gear before you get into the turn, or just use the shift knob to make it easier. To say that the Veloster is an attention grabber is an understatement. The silver test car drew looks from everyone from the urban test route. Why shouldn’t it? It looks like nothing else on the road. The Turbo is a bit more aggressive looking compared to the regular Veloster, with a larger front grille opening for the added intercooler, more prominent side sills, 18 alloy wheels, and the rear gets an integrated rear diffuser and dual exhaust center exhaust tips. The inside is unique and refreshing. Open the door and you are reminded immediately that the car is fitted with a turbo with the writing on the seats. The writing and the interior was accented with a blue finish. Close the door shut and press the Start button on the center stack and you are greeted with the Hyundai logo on the center screen. The buttons on the center stack are easy to read and easy to find quickly so you can maintain your focus on driving. The gauge cluster is straight forward and clearly visible with illumination that is easy on the eyes. The dash is textured plastic that makes its way into the door panels, however the steering wheel is wrapped in leather. The doors have two handles, one that is recessed into the middle arm rest like on every other car, and then another that protrudes vertically and loops around. Grab and pull that extra handle to close the door and you can hear the creaking of the plastic rubbing against each other. I think its one of those styling elements that was added for the sake of adding it, but could have been left out and been perfectly fine. The rear is spacious enough for two people and the 3rd door on the passenger side makes it easy to get in and out however, having a 4th door would have been nicer. The Turbo has considerable space behind the rear seats, a best in class 15.5 cubic feet of it, making storage a cinch. The leather seats are supportive and are heated in the front along with driver’s side having lumbar support. 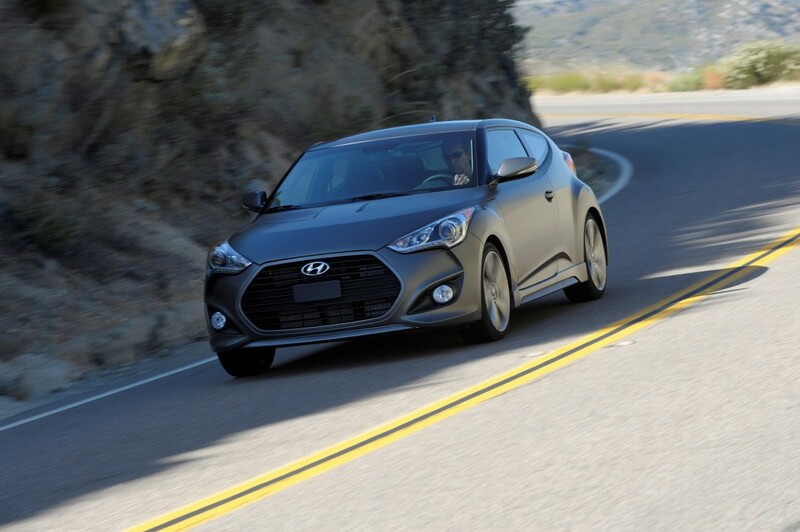 The Veloster Turbo comes standard with Hyundai’s telecommunications system, Blue Link. In the test drive, it was hard to be able to use it, however voice commands worked like a charm when using the Navigation system. Visibility is somewhat hampered by the large D-pillars and the rear support beam on the hatch can take a little getting used to when looking in the rear view mirror but it is high enough to not bother you too much. As fun as the Veloster Turbo is when charging from corner to corner, its a different story when taking a corner. Hyundai decided not to change the suspension other than swapping in a quicker ratio steering rack (13.9 for the Turbo vs. 14.2 for the non-turbo). When asked about this decision, the Hyundai rep said, “the car is already fun to drive!” I unfortunately had to disagree. While the car is composed and stable, the dynamics weren’t what I had hoped for a performance model. Body roll is evident, while not overly so, but it could clearly benefit from being stiffer. Its natural tendency is to understeer and it showed when getting onto an on ramp with its tires screaming in protest. The steering rack provides little feedback and is numb on center even though turn in is precise, thanks to the quicker ratio rack. The interior does a good job of keeping most of the outside noise from intruding the cabin, but its almost too quiet for a touted performance car. An aggressive exhaust would do the trick. Driving this car led me to conclude that dynamically, it is lacking even though the drivetrain tries to make up for it with its surge of turbo power. The Ironman Silver tester came in at a reasonable $26,320 including the $95 floor mats and the $2,500 Ultimate Package (the only package available) which included the Panoramic Sunroof, back up camera, automatic headlights, navigation, and a 115V outlet. The price puts it up against some formidable competition from Volkswagen, Mazda, Honda, and soon to be Ford. While it packs some serious content for the price, how it will stack up to the competition remains to be seen. Perhaps a future comparison? Stay tuned.